Tornado Damage to Retail Stores May Cause Insurance Disputes | The Voss Law Firm, P.C. Severe storms can devastate homes and businesses for miles, and insurance is the only hope many people have of restoring their lives to normal. 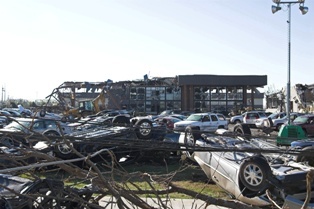 Texas retail businesses face unique challenges when it comes to protecting employees in a tornado and preventing losses from spiraling out of control. Attorney Bill Voss evaluates the types of damage retail stores have suffered from previous storms and offers tips to protect retail businesses before the next tornado strikes. Researchers have discovered serious tornado risks for large warehouse stores, such as Wal-Mart and Home Depot. Although these structures are required by building codes to sustain winds up to 90 mph, they are overwhelmingly likely to buckle and collapse during a tornado. The larger a structure is, the more vulnerable it is to roof collapse, flattening the building and injuring or killing any occupants. Lack of safe rooms. Many engineers recommend that large retail businesses have a dedicated safe area that is reinforced to withstand extremely high winds. Without these structures, employees and customers may be injured as debris falls from the ceiling, become trapped under rubble, or even be blown from the building during the storm. Oversized debris. Big box stores usually have large windows across the front and sides, tall walls, and long spans of flat roofing. Long, flat structures are among the first to succumb to high winds, while long pieces of the roof may be picked up by the wind like a sail, shearing the entire top of the building off. Anchoring problems. Warehouses must be properly constructed and anchored to the ground to prevent them from becoming airborne when a tornado strikes. Outbuildings, sheds, machinery, and large consumer items may fly through the air if not tethered, and the retail structures themselves may be lifted from their foundations. Losses from major weather events not only impact the physical structure of your business, but also the income you will generate in the months and even years to come. The first thing you should do is gather all of your policy documents together and notify each carrier of your intent to file a claim. Next, you will have to secure the property so that nobody gets hurt while you are waiting for the insurer to issue payment. Build a strong claim file. Your own records should include before and after pictures of the damage, estimates of your losses, inspection notices, municipal safety warnings, and any letters or email exchanges between you and the insurer. Anticipate covered event disputes. Tornadoes typically bring other adverse weather along with them, including hail and severe thunderstorms that cause flooding. Your insurer will want to know which event caused the damage, especially if you do not have coverage for all weather-related perils. In most cases, flood damage due to rainwater is covered through a separate flood insurance policy, although there may be exceptions for losses due to backed-up storm drains. Expect restoration delays. Some delays are inevitable after a disaster, such as construction delays due to blocked roads or losses due to downed power lines. Collecting a fair amount for your losses may take time, but you should question the insurance agent if you suspect your tornado claim is being deliberately delayed. Estimate your business income loss. While some businesses will see increased consumer activity immediately before and after a storm, the income is usually not enough to offset the damage the business sustains in the event. Residents who need to rebuild their homes may need wood, nails, and paint, but they will likely not have the funds to shop for clothes, shoes, or other nonessentials. Your policy should include an amount to replace lost income until you are back in the black. Note the precautions you have taken. Many insurers will lowball or deny payment for damages that could have been prevented, such as water intrusion from a failure to board up window before a storm. You should make a list of the actions you have taken to protect your business from damage, such as installing a generator, purchasing building code upgrade coverage, and training employees on proper tornado warning procedures. If you are having trouble getting an insurer to pay for tornado damage to your business, we can help you get the maximum amount of coverage allowed under your policy. Simply fill out the form on this page today to contact an insurance attorney at the Voss Law Firm or order a free copy of our book, Commercial Property Owners Must Read This BEFORE Filing an Insurance Claim. How Long Do I Have to Submit a Commercial Tornado Insurance Claim?